Elementary years are critical in the life of each and every child. At Red Lion Christian Academy, we intentionally partner with parents to provide a family style environment where Christ reigns supreme. During the elementary years, students expand their world academically through differentiated classroom instruction and curriculum linked field trips. Academic excellence in line with consistent individual improvement is the key to maximizing student achievement. Students explore their world through studies in the five core subjects, bible, math, language arts, science and social studies, as well as through studies in related arts. Subject matter gradually increases in complexity from kindergarten through fifth grade. In-school and after school learning provides students with a wide array of experiences so that they have the opportunity to discover and develop their God given gifts and abilities. Providing high level academic instruction that reaches every student and that is taught through a biblical worldview is the goal of the entire lower school program. The curriculum materials (Christian coupled with secular) consist of a combination of traditional and innovative instructional resources, techniques, and strategies in all core subject areas. Bible is not only integrated into all core subjects, Bible is a core subject and is taught in all grade levels beginning in preschool and continuing through high school. Scripture memorization begins in our three year old preschool program with simple monthly verses. In the four year old preschool program students learn and apply a new Bible verse each week. In Kindergarten, students begin memorizing using the accumulated memory technique. Kindergarten verses are tied to letters of the alphabet and geared toward character building. Each week a new verse is memorized and the previous verses are reviewed. 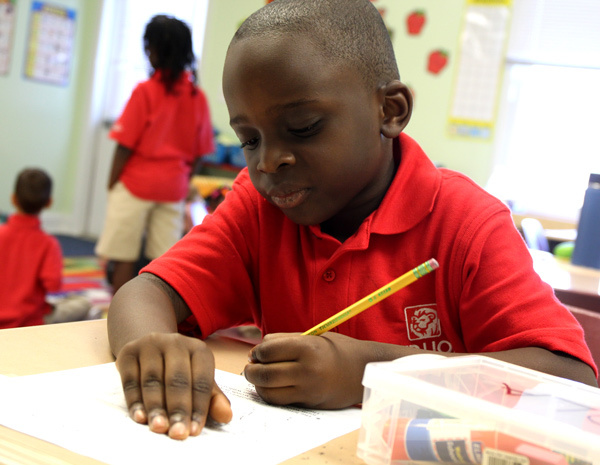 Once students enter first grade they are formally apart of the school’s accumulated scripture memory program in which all students, no matter what grade level, memorize the same verse each week adding additional verses to memory as the year progresses. For first through twelfth grade students, the accumulated scripture memory program has three cycle years and students have the opportunity grow in knowledge and understanding of God’s word as they return to the same verses in future years at RLCA. RLCA is utilizing Saxon Math as the foundation for Kindergarten through Fifth Grade. Saxon Math has been used by educators for over thirty years and is known for its ability to help students grasp concepts and develop high level reasoning skills. The focus is on not only increasing student knowledge of math facts and principles, but also teaching students how to utilize this information in complex, multi-step “verbal” problem solving. Instructors engage all students, challenge accelerated students, and provide reinforcement for those who need more support. Concepts are introduced and reviewed throughout the entire school year for maximum retention and application. In addition to Saxon Math, Red Lion accelerated math students are challenged through ABeka Math. ABeka provides a rigorous computation program that helps students develop accuracy and speed as they apply concepts to more difficult problems. Students who have met the requirements of the accelerated program receive small group instruction from their math teacher and also work independently. Accelerated math students are responsible for the Saxon Math concepts, especially those that center on reasoning, as well as the ABeka material. Language Arts is not only a core subject but one of the most important as it impacts all other subjects. Language skills are being developed very early on in preschool with letter/sound recognition, expressing thoughts/ideas, sequencing events, and demonstrating comprehension by answering simple questions. Students move onto Kindergarten ready to read. In Kindergarten teachers provide vigorous instruction in phonics and sight word recognition. Students read well by the end of kindergarten and are ready to transition to first grade. In first and second grades, students improve their reading skills adding vocabulary and special phonics sounds to their knowledge base. By third grade students are reading to learn. Phonics concepts are reinforced through spelling.In first through fifth grade, there is a heavy focus on reading comprehension as students should not only read well but also understand fully what they read. In addition to reading and reading comprehension, vocabulary, spelling, grammar, writing, and hand writing are key components in our Language Arts curriculum. Starting in first grade and continuing through fifth, Red Lion Christian Academy utilizes Shurley English for its grammar and writing curriculum. Shurley English has been utilized by educators for over 25 years. The grammar portion teaches the parts of speech and sentence structure with a spiral approach. Students are constantly identifying and labeling every word in every sentence. Catchy jingles, leading questions, colorful illustrations, and regular review help students memorize and apply the concepts learned. A wide variety of scholarly writing techniques are taught utilizing the grammar learned. The result, stellar writing mechanics without any stress! Through Science students explore specific areas of study, giving them a glimpse into God’s creation and its innermost workings. Life science (ie: animals, plants, ecosystems, habitats, classification, cells, human body), physical science (ie: energy, matter, force, machines), and earth and space science (ie: lithosphere, hydrosphere, atmosphere) are covered exposing students to various fields and providing a solid overview as they move into Upper School and the more specific studies offered at the 6th through 12th grade level. ACSI Purposeful Design is utilized to teach elementary science. The textbooks are current and rigorous in their content. Teachers provide hands-on activities and experiments to make the content come alive. Field trips enhance lessons and encourage budding scientists to excel. The fun and ease of learning science at Red Lion is unforgettable and provides many memorable experiences to support knowledge acquisition and retention. In Social Studies, students learn about our world and its people. Preschoolers start with what is familiar to them, in subsequent years students are taught about people and places, from the past and current day, continually broadening their horizons. Fifth grade culminates with an International Fair attended by the entire elementary school. Hands on projects and field trips are built into the curriculum to help students enjoy and fully grasp what they are learning. "Curriculum is supported by BJU Press Heritage Studies student textbooks and corresponding materials. " Focus: Developing a Christian worldview of the family, community, America, and the world. Focus: Developing a Christian perspective on United States history from Native Americans to the founding of the independent nation. A highlight of second grade is participating in the Thanksgiving parade in period costume. Focus: Learning about the founding and growth of a new nation from a Christian perspective. Highlights of fourth grade include the class presidential election and small business unit through which students actually earn funds which support the senior mission trip. Highlights of fifth grade include a biography unit and the International Fair. The biography unit culminates with a first person presentation of the famous person each student studied. The International Fair fills our entire gym with exhibits from all over the world that engage all our senses. In Physical Education (PE) there are two main areas of focus: fitness and skill development. For fitness, the beginning of every class is spent stretching, warming up muscles, and increasing student heart rate. The students learn the importance of these exercises and why fitness is critical for overall health. For skill development, CATCH curriculum is utilized to introduce students to different sports and teach them the basics. Physical Education class builds skills gradually from preschool through fifth grade. Students experience team and individual athletics enough to be successful in class and if desired, express interest and play competitively in middle school. Students in fourth and fifth grade have the option of changing into athletic attire for PE. See the student handbook for details. All students must wear athletic shoes to class in order to participate.